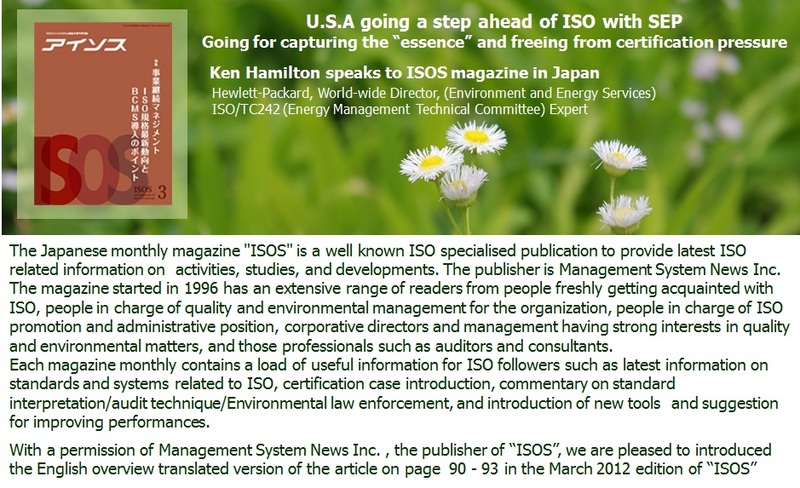 US ISO 50001/TC242 Epert speaks to Japanese ISO specialized publication "ISOS"
[ISOS] ISO has a great expectation in the EnMS standard and very keen in promoting it. As an expart having involved in the development of the standard, what do you think is the background behind the spirit. We do not feel so much boost about the standard in Japan yet. I think the international standard is no longer only to standardize a product but becoming a standardization for the puropose of organizations to communicate beyond the national boundaries. The Japanese companies in domestic are very keen in energy conservation drive and demonstrating a remarkable result, however once going out of Japan EnMS operation may not be as effective. I believe for Japanese companies when doing business overseas ISO 50001 becomes a very benefitial tool. For example HP I work for supplies various parts globally which means we have to observe the energy use and greenhouse gas emission reduction globally, and therefore the international standard such as ISO 50001 is indispensable. [ISOS] ISO enphasizes strongly that ISO 50001 is closely connected to business aspects doesn't it? [Ken Hamilton] During the ISO 50001 energy management launch event that I attended, as the ISO Secretary-General Rob Steele stated “The energy performance improved by ISO 50001 minimizes the energy sources and energy related assets, and as the result, it facilitates speedy benefits to organizations by reducing the energy cost and energy consumption.”, it is the standard directly connected to business. With ISO 14001, the focus was how to eliminate negative impacts and therefore cerification was closed up more thean performance, whereas for ISO 50001, performance is to be focused over certification. There seem to be a mis-perception in general that in order to verify the conformity to the management standard, the third party certification assessor is required. I think this creates confusion. In order to implement ISO 50001, there is an option to self declare conformance. Electricity, gas, oil, renewable energy etc. with different kinds of energy options, organizations have to sustain business with energy performance in mind, and in order to do so, it requires some sort of international guideline. I think ISO 50001 is just that. Of course ISO 50001 is not a perfect standard, so requires continual improvement. To do so, the mission of PC242 to develop the standard is upgraded to TC242 by ISO to continue discussions as the ISO 50001 series. At this moment there are four topics “Implementation guideline; Energy baseline Energy performance Indicator; and Energy audit) forming sub-committees (SC) in further discussion. The “energy audit” is not EnMS audit like certification audit or internal audit but is a site investigation audit to identify energy conservation opportunities for an organization. The U.S.A. is aggressive in taking up EnMS as the EnMS national standard was established in 2000 and took position in chairing the ISO 50001 development. Please tell us about the latest EnMS trend in the U.S.A. I am currently acting as a member of U.S.CEEM. U.S.CEEM main members are from industrial sectors, such as Dow Chemical, HP, Toyota Nissan etc. as well as DOE. U.S.CEEM has helped to develop ISO 50001 based “SEP” program (refer to Chart 2) for promotion. SEP is developing a detail guideline for measuring and verifying continual energy performance improvement, and is addressing ways to evaluate the result which is taking a step ahead of ISO/TC242. One of the SEP activities especially gained attention was the pilot project by 5 companies in Texas (all manufacturing units) to establish and implement EnMS operation following ISO 50001 DIS version, and gained a remarkable results. One of the piloted companies was Dow Chemical said to be the most energy consuming private group globally. The piloted plant achieve 17.9% energy saving by implementing EnMS operation. Not only the above mentioned large scale plant, even a small scale unit in the pilot project obtained a good result. The plastic moulding factory, CCP with 36 employees. CCP with 14.9% saving target for 2 years EnMS implemention, was able to save 250 thousand dollars in one year at zero capital. With the implementation, CCP was able turn from the deficit to profitable situation. Other three companies in the pilot project gained similar result. The first phase pilot were under cooperation of Texas University and Texas based NGOs so the piloted companies were scoped within Texan. 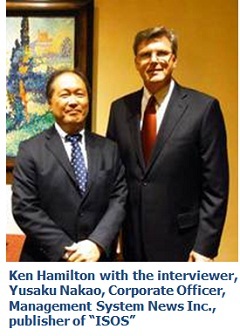 For the second phase the project was expanded to 60 companies throughout the U.S.A. and has started in April 2011. SEP is an activity in the U.S.A. but there is a global program GSEP has also being set forth. [ISOS] What kind of program is that? 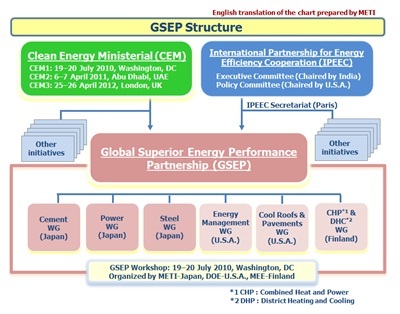 [Ken Hamilton] During the Clean Energy Ministerial (CEM) took place in July 2010, Global Superior Energy Performance Partnership (GSEP) was founded as an Japan-U.S.A. initiative related to energy conservation (refer to the chart on the right prepared by METI, Japan). In GSEP, there are 6 ongoing working groups (WG), and 3 WGs (Cement, Power, Steal) chaired by Japan, 2 WG (EnMS certification, Cool Roofs and Pavements) chaired by the U.S.A. and 1 WG (Combined Heat and Power and Efficient District Heating and Cooling) chaired Finland. The WG are liased with METI for Japan, DOE for the U.S.A. and Ministry of Employment and the Economy for Finland. [ISOS] For the 5 piloted plants in Texas in the first phase, and 60 additional piloted plants throughout the U.S.A. in the second phase, would SEP recommend to ISO 50001 certification? [Ken Hamilton] To obtain ISO 50001 certification or not, SEP believes the decision is to be made by energy user organizations. If you take the direction to pursue the “essence” of continual energy performance improvement, you do not have to obtain the certification. The power of SEP is while taking ISO 50001 as the base, it further details the areas of energy baseline and energy performance index (EnPI) in defining guideline. [Ken Hamilton] ISO 50001 should not been considered first on certification, but to be more broadly understood and accepted based first on improving organizations’ energy performance. To obtain the standard, it requires certain cost however the cost of appreciating the standard is free of charge open source, so it should be used on a common base. For ISO certification assessment organizations, their mission may be for clients to obtain certification. On the other hand, for ISO 50001 standard, through self-certification scheme they may come up with a viable solution to satisfy their clients at more attractive cost. In fact there are already some innovative certification assessment organizations pursuing such scheme.